LATE EDITION! Although this is no longer breaking news–it hit the airwaves last week–it is still important to keep it in the forfront, lest even one American fail to realize its critical nature, or, worse yet, think that it is no longer a problem. I received this today from Alan Gottlieb, Chairman of the Citizens Committee for the Right to Keep and Bear Arms, which tells us that the matter is not moot, and that we must continue to address it until it is resolved in keeping with our Nation of Laws and our Constitution, upon which they are based. Napolitano Declares Propaganda War On Americans ! While we agree that we must fight extremists who are both foreign and domestic we are troubled by some of the statements your department included as fact in the report titled above, without listing any statistical data to back up such claims. First, your report states that “Returning veterans possess combat skills and experience that are attractive to rightwing extremists…” without listing any data to support such a vile claim against our nation’s veterans. Second, the report states that the millions of Americans who believe in the Second Amendment are a potential threat to our national security. Why? Do you have statistics to prove that law-abiding Americans who purchase a legal product are being recruited by so-called hate groups? Thirdly, the report states that those that believe in issues such as pro-life legislation, limited government, and legal versus illegal immigration are potential terrorist threats. We can assure you that these beliefs are held by citizens of all races, party affiliation, male and female, and should not be listed as a factor in determining potential terror threats. A better word usage would be to describe them as practicing their First Amendment rights. Also, you list those that bemoan the decline of U.S. stature and the loss of U.S. manufacturing capability to China and India as being potential rightwing extremists. We would suggest that the millions of Americans who have lost their jobs in the manufacturing industry to foreign countries are not potential terror threats, but rather honest Americans worried about feeding their families and earning a paycheck. Suspending Civil Liberties – The Reichstag Fire Burns Again? On February 27, 1933 the message went out in Germany about the national congressional building “The Reichstag is on fire!” The government turned a blind eye to the terrorist attack because they knew what government officials have known throughout history – that during extreme national emergencies, people are most scared and thus much more willing to surrender their liberties in return for “security “. The day after the fire a decree was issued entitled, “For the Protection of the People and the State.” Justified as a “defensive measure against Communist acts of violence endangering the state,” the decree suspended the constitutional guarantees pertaining to civil liberties: NOW DHS DECLARES THAT SECOND AMENDMENT SUPPORTERS ARE “RIGHTWING EXTREMISTS”: TELL CONGRESS TO CONDEMN THE REPORT! According to news reports, the Department of Homeland Security is warning law enforcement officials about a rise in “rightwing extremist activity,” labeling citizens opposed to new firearms restrictions, returning veterans and conservatives as “rightwing extremists” and associating them with white supremacists and violent antigovernment groups. You read that right — it appears that the Obama Administration, and especially the DHS under Janet Napolitano, is trying to demonize political dissent. And it’s no big surprise who’s directly in their crosshairs: supporters of the Second Amendment, including veterans and gun owners. Who is funding this kind of nonsense? Well, YOU are. Why would your government spend your money attacking YOU, instead of spending your money PROTECTING you? This calls for grassroots action, on a HUGE scale! Why are they worried? Because since November, more than 7 million people have applied for criminal background checks in order to buy weapons. And as far as the Obama administration is concerned, buying guns equals “weapons stockpiling,” buying ammo equals “hoarding of ammunition,” and expressing concern about Congress passing gun control legislation qualifies YOU as part of an “extremist group.” Therefore, you and I are now being viewed as dangerous rightwing extremists that law enforcement officials need to be watching out for! Well, there you have it! Anyone who even THINKS about any of these issues as a potenial or very real problem is considered a dangerous rightwing extremist, or DRE! As ridiculous as it seems, that report was distributed to law enforcement officials across the state of Missouri, and it wasn’t until the state government was FLOODED with protests from patriotic Americans across the country, that they finally came out and denounced and retracted the MIAC document. And now, it’s happened again — but this time, at the Federal level! Our own government is turning against us, and unless there is a HUGE outpouring of outrage from every part of this nation, it will just keep getting WORSE! [NOTE: Jeff Epstein, of America’s Truth Forum and guest on Monday’s upcoming “The Dame Truth” sent this today, which fit perfectly with this post. There are NO accidents… World Net Daily ‘s article dated April 23, 2009 states that David Schippers, who researched the Oklahoma City bombing in detail with Jayna Davis, asserts McVeigh and Terry Nichols were not the lone conspirators but part of a greater scheme involving Islamic terrorists and at least one provable link to Iraq. This supports the belief that although THERE WERE JIHADISTS INVOLVED WITH MCVEIGH IT IS NEVER EVER MENTIONED in main stream media]. The DHS and MIAC authors of this pejorative edict are pushing an “Us against Them” philosophy. A significant majority of the American People, those upon whose backs much of the responsibility for the financing of our government lies, are being marginalized, slandered, libeled and labeled as fringe kooks, “rightwing extremists,” so that it will be easier to violate their liberties and take away our right to keep and bear arms in the future. The only thing that will put a STOP to this nonsense is a huge public outcry opposing it. If we do nothing, however, it will soon be too late to do anything. We either stop it NOW, or it will grow into an out-of-control monster that will monitor and control the personal opinions and speech of every man, woman, and child in this country. Long Live Talk Radio–Our Only Hope! Yesterday, a listener posed a question at the Facebook Event wall for our Constitutional Radio show: he asked what made us different from ‘all the other’ radio talk show hosts. I replied thusly. I’d like to thank you for raising that question! Firstly, I think it is a mistake to disparage talk show hosts, as we are now the only respite from the propaganda machine that has supplanted the news source that was once main stream media. We are the last bastion that stands between fact and complete lack of information, total disinformation, news suppression and out and out propaganda. Secondly, it is always a mistake to make generalizations because of the vast difference and array of talk show hosts, topics and objectives. 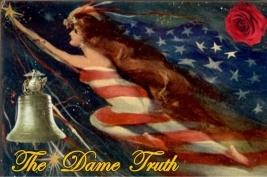 Thirdly, what distinguishes drkate and me [a/k/a Dame Central] in our “Constitutional Radio” initiative [and “The Dame Truth” and “Kicking Back“] is that we strive to EDUCATE ourselves and our listeners so that we are AWARE of both the LAW and our OPTIONS in working to restore our Constitutional Republic. We take great care with respect to whom we invite as guests, always keeping in mind that our goal is to EDUCATE, MOTIVATE AND ACTIVATE concerted response to the issues our country faces today. We continue to be at the forefront of NETWORKING, MOBILIZING and ORGANIZING Americans to EXERCISE THEIR CONSTITUTIONAL RIGHTS of FREEDOM OF EXPRESSION, RIGHT TO ASSEMBLE, and right to bear arms, these being the First and Second Amendments to our Constitution, and the first two amendments of the 10 that comprise our Bill of Rights. Why do we do this? Because we see a great need for Americans to have places to gather and learn, to support one another and our Constitution, and exercise their role as citizens in the greatest Constitutional Republic in the history of the world. Again, many thanks for asking the question, and for giving us the opportunity to answer! For that’s what America is all about! Stay tuned for things to come, and ever more news about what we are all doing to preserve and protect our Constitution, our Country and our Freedoms.